Would independence really help those living in poverty? Like many Scots I was struck by the SNP poster depicting a little girl with scuffed shoes, dirty legs and a tattered skirt. The slogan ran “Let’s become independent, before 100,000 more children are living in poverty”. The first thing that struck me was that no political party in Britain wants children to live in poverty, but that we have different ideas of how to make people in Britain better off. Some people think that raising taxes and public spending is the answer, while others think that focusing on policies that will lead to economic growth will benefit everyone. Most people nowadays, whether they are more or less left of centre or right of centre, accept that the key to prosperity and ending poverty is economic growth. There are differing viewpoints on how large the state share of GDP should be, but it’s a matter of degree. Some people on the right think it should ideally be around 30%, but accept that getting it down to the low 40s is more realistic, while some people on the left think it should be rather higher. But the amount you can vary this figure either up or down is limited without the risk of doing damage to the economy and anyway it can only happen slowly. Once you get much above 50% it begins to seriously affect the economy’s capacity for growth. This in essence is the problem that M. Hollande faces together with the recessionary effect of being in a fixed exchange regime when France needs gradual currency devaluation. What this all means is that most politics is a lot of sound and fury about not very much. There is a balance between economic growth and public spending. Lowering the state share of GDP will help growth, but potentially damage things we want governments to spend money on. For this reason, all political parties are really only debating about a couple of percentage points of state spending of GDP, somewhere in the low to mid-40s. But the SNP claim that life would be different in an independent Scotland and that we could have a Scandinavian style economy which would eradicate poverty. Well let’s imagine that an independent Scotland raised public spending to the mid-50s % of GDP like Denmark or Finland? I strongly suspect this would damage economic growth in Scotland, but accept that we may suddenly turn into Finns and Danes who for some reason seem happy to work hard and not take advantage of their incredibly generous welfare state. If you think likewise, by all means vote for independence. But be aware you could equally end up like France. But anyway let’s imagine an independent Scotland following more or less Scandinavian socialist economic policies, while the UK follows free market capitalism. How would it be possible to maintain a currency union between such divergent economies? What would happen to the UK single market of goods and services on which 70% of Scotland’s trade depends? In reality if you want to maintain anything like the present economic relation between Scotland and the other parts of the UK it would be necessary to follow a broadly similar economic policy. So the scope for change in an independent Scotland is limited at best. Again we’re talking about those one or two percentage points of GDP. What is poverty and how do you attempt to help people not to live in poverty? Well firstly it’s important to realise that in the UK poverty is defined as 60% of average income. Well average earnings in the UK are £26,500 so anyone earning less than £15,900 is living in poverty. Well there are a number of ways in which it would be possible to add 100,000 poor people to Scotland. One way would be if we had economic growth such that average earnings went up to £30,000 a year while the rate of increase for the poorer people was somewhat lower. Thus if I was earning £17,000 pounds a year I would now be poorer than if I had been earning £16,000 pounds earlier, for the poverty line would now be £18,000. In Poland average earnings are rather less than Scotland. Many people earn only around £6000 pounds a year. What this means is that someone earning £12,000 pounds a year in Poland who moved to Scotland in order to earn £15,000 would be moving from wealth to poverty. Why would so many people want to do that? It’s fairly obvious that are making calculations about poverty in a different way. We all know that there are people who live in real need in Scotland. But it is important to put this into perspective. Even by European standards there are far fewer genuinely poor people in Scotland than there are in Eastern Europe. I’ve walked down streets in provincial Russia where old ladies sell a few bulbs of garlic, where average earnings are £200 pounds a month and where there is no unemployment benefit whatsoever. That is what poverty looks like and Russia is wealthy compared to most of the world. The concept of relative poverty is not really a measure of poverty at all. It’s a measure of inequality. Thus if everyone in Scotland earned £10,000 pounds a year and there was no variation in salary whatsoever we would have eradicated poverty in Scotland. Is that how the SNP want to help poor people after independence? What matters is not so much relative poverty as the ability of poor people to buy the things that they want and to have a standard of living that enables them to eat well and enjoy the good things in life. The best way to achieve this goal is for governments to have policies that lead to economic growth. With economic growth everyone benefits, both the rich and the poor. It's something of a paradox, but if through cutting the state share of GDP you raise economic growth beyond what it would have been, the poor will certainly benefit, not least because as the economy grows the share of resources dedicated to alleviating poverty will increase in value. The austerity of the past few years has been unpleasant for many, but it has worked. If we had failed to take the necessary steps towards prosperity, the economy would have continued to shrink which would have made everyone including the poor, poorer. The UK economy has low inflation and a good level of growth. We are very lucky indeed compared to France, Spain, Italy and many other European countries. We also made better choices than they made. There are challenges ahead and recovery is not yet completely secure. But when a patient is beginning to rise from the sick bed you don’t amputate one of his legs. You certainly don’t do that if you live in that leg and hope to help the poor who live there with you. Like many Scots I have mixed feelings about the EU, I’ve even in the past been somewhat sympathetic to some of the Eurosceptic arguments. I’m becoming more and more in favour of the EU however, and this has most to do with my reflecting on the arguments for and against Scottish independence. What do I like about the EU? Well I like the fact that I am able to live and work in any EU country. I used to work at the University of Copenhagen. I sometimes wonder if it might not be nice to retire to one of the Canary Islands or Portugal. I rather like the fact that there’s passport free travel in the Schengen zone and on the whole wish that the UK was a part of this. It would make life easier for my Russian husband. It’s much easier to be able to use the same money in Spain and Germany. The thing I like most about the EU however is the single market. This is the major achievement of EU integration. The fact that we have access to European labour markets is one of the main reasons why the UK economy is doing so well just now. People complaining about Poles coming here to work understand nothing about economics. What don’t I like about the EU? Fundamentally I don’t like the fact that power rests with unelected officials or the European Commission. I don’t like the fact that unelected people, whether they be civil servants or judges, can tell democratically elected politicians what to do. I don’t like the way the EU seems constantly to try to make everyone follow the same rules. Some of this is necessary no doubt, but some is petty and pointless. The thing I like least about the EU is their attempt to have monetary union without a political, fiscal and transfer union. For all the convenience for tourists like me it has been a disaster especially for southern Europe. What sort of Europe would I like to see? I suspect that many people in Scotland would like to see an EU like the one we voted for all those years ago, a trading block of sovereign independent states. But this is not on offer, and really we’ve been kidding ourselves if we thought that it was ever on offer. It is even less on offer now. The structural problems in the Eurozone can be solved only by breakup or by much closer integration. There may have been a time when large, sovereign, independent states could maintain a currency union without a political, fiscal and transfer union, but that time has clearly passed. There may be any number of reasons for this. Perhaps the sheer speed of modern currency transactions and the way markets work today makes such currency unions undesirable. Really the reasons don’t matter. The Eurozone is an experiment in currency union without political union and the experiment has failed. This is one of the main reasons why Quebec has pretty much recognised that independence is off the agenda. They know that the rest of Canada would never agree to a currency union. It would be crazy for them to do so. The breakup of the Eurozone could turn into a catastrophe that would make 2008 look like a blip. But anyway if the Eurozone were going to breakup, it would have done so by now. The EU then is going to move towards becoming a single nation state a United States of Europe (USE). It has no choice. It has been moving towards this goal anyway from the beginning. What I hope is that this USE comes to resemble the USA. The USA has a democratically elected president and bicameral parliament. Each state in the Union has considerable devolved power, but is neither independent nor sovereign. If that model existed in the EU, I would grab it with both hands. I would also recommend that the UK join such a USE. It would be stupid not to. I strongly suspect over the next 20 or 30 years that this will be the choice for semi-detached countries like the UK or Denmark. The choice will be between remaining an independent nation state and remaining in the EU. In the 60s the French blocked the UK from joining the EU, correctly fearing that we would act as a hindrance to EU integration. Countries that focus too much on their independence and their sovereignty are always going to act as a block to the EU project. But they cannot possibly allow this now. Too much is at stake. Eventually for the Eurozone to work, each nation state will have to forget that it is independent and treat everyone in Europe as if they were a fellow citizen. Thus wealthy Germans are going to have to be willing to transfer money to impoverished Spaniards in exactly the same way that they transferred money from West Germany to East Germany. If that doesn’t happen and happen rather soon the impoverished parts of Europe, including France, will not sit idly while they endure permanent recession and austerity. They will break the Eurozone no matter what the cost. It should be obvious now that the slogan “independence in Europe” is at best a misunderstanding at worst a lie. If Europe becomes the USE we would have a devolved parliament in Edinburgh and we would vote hopefully for a democratic president and parliament in Brussels. But we would not be independent, for sovereignty would be in Brussels, just as sovereignty in the USA is in Washington. Fundamentally this is no different from what we have now. We have devolution and we are going to get more of it if we vote no. Sovereignty, beyond mere flag waving, in the end is not on the agenda no matter which way we vote in the referendum. It’s becoming an archaic concept. There are huge advantages of being in a union of states. The USA has such economies of scale that it would be wealthy even if it only traded with itself. A democratic union of states in the EU would likewise be massively advantageous economically and socially. It would bring living standards in southern Europe up to those in northern Europe. But the price that has to be paid for this is that the various parts of Europe give up nationalism. If you can’t work successfully in a four nation state like the UK how do you suppose you’re going to work in a 28 or more member state like the USE. If the Scots and the English cannot bear to live together in one nation state, how are we to live together with the peoples of Europe in one nation state? If you’re unwilling to transfer your wealth around the UK, what are you going to say when told that you must transfer it to Portugal or Greece? Nationalism is the enemy of EU integration. So long as people focus on resurrecting historical borders, they will not be looking towards a future when such borders are no more. People who understand the European project realise that it is not only unnecessary for a place like Bavaria to seek the independence it lost in 1871, it would also be futile and self-defeating. Secession is the opposite of what is required and for this reason, if for no other; the EU would look on an independent Scotland’s application with distaste as something unhelpful and not to be encouraged. Scottish nationalists who really want independence as opposed to merely creating a border between Scotland and England realise that real independence is incompatible with EU membership. It is for this reason that many of them are just as much Eurosceptics as UKIP. This position at least has the virtue of being consistent and logical, but it ignores the merits of countries pooling their sovereignty and working together. The process by which the UK came together all those centuries ago is precisely the example that the EU needs to become a successful nation state. There too former enemies are putting aside their differences and finding what they have in common and pooling their sovereignty to create a whole that is greater than the sum of its parts. They must find our focus on refighting medieval battles rather quaint. “The territory or land of a nation; usually an independent state, or a region once independent and still distinct in race, language, institutions, or historical memories, as England, Scotland, and Ireland, in the United Kingdom, etc. Scotland is a country, but in an unusual sense, because while most countries are independent nation states Scotland is part of an independent nation state, the UK. The referendum on independence is about whether Scotland ought to become a nation state. You clearly cannot become what you already are. When pointing out that Scotland is a country in an unusual sense am I in any sense being derogatory about Scotland? Not at all I’m simply pointing out that although we are fully and completely a country, we are not an independent country. It is not derogatory to point out something that independence supporters obviously recognise to be true. The reason why Scotland is described as a country is because we once were an independent country and this fact has been retained in our collective memory and language. Certain other attributes that frequently go along with being an independent country were also retained, such as a distinct church, education system, football team and banknotes. Whereas some European countries became very centralised and attempted to abolish the distinctions between the formerly independent countries from which they were formed, we in the UK were fortunate to live in a country that was largely accepting of difference and happy to embrace it. Whereas governments in, for example, France did their best to make everyone French, following exactly the same laws and speaking exactly the same language, the UK was more liberal and more willing to allow historical distinctions to remain. British governments did not set out to erase from the map and from memory the historical borders in the UK as happened in much of Europe. Thus the retention of the distinctions between the countries of this UK, far from this being a reason to leave Britain, is a reason to recognise the benefits of staying. Scotland is accurately described as a country because we were once independent, but formerly independent countries are not hard to find in Europe and thus have an equal claim to seeking independence as Scotland does. The kingdoms of Bavaria and Sicily were independent nation states long after Scotland ceased to be independent and could equally accurately be described as countries or nations if that is how the people living there chose to use their language. Moreover Scotland too was once made up of independent countries. The Kingdom of Strathclyde (450 AD-1093 AD) stretched across the present border into Cumbria. The Kingdom of Dál Riata (circa 500 AD-839 AD) stretched across the sea into present day Northern Ireland. 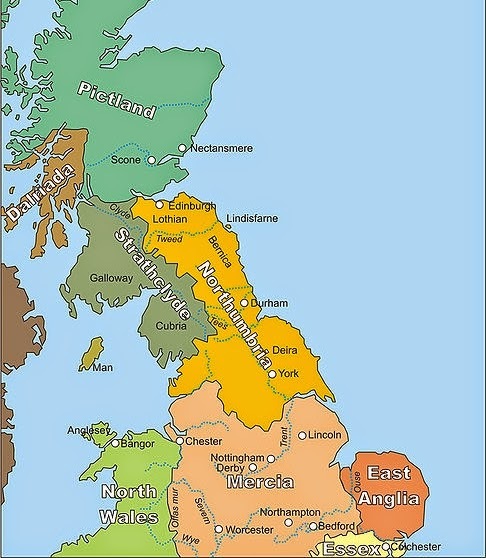 The Kingdom of Northumbria (653 AD-954 AD) likewise stretched across a present day border all the way from Edinburgh to York. Each of these formerly independent countries has as great a claim to independence as does Scotland (843 AD-1707). It is entirely arbitrary to pick one historical boundary rather than another. Too many nationalists glide from the idea that Scotland is a country to the statement that we ought to be an independent country. But this clearly does not follow. If it did, then anywhere that once was independent ought to be so again, which would mean that we should not be seeking independence for Scotland, but for those former countries that once made up Scotland. It is purely an accident of history and linguistics that we don’t generally describe Strathclyde as a country. You cannot base a claim to independence on something so flimsy; otherwise I might as well justify the independence of Fife on the grounds that it is called a Kingdom. Through the progression of history the United Kingdom has become a nation state. People who are from that nation state are called British. The borders of the UK came about through a process of unification, but so did the borders of Scotland, so did the borders of nearly every European country that is not tiny. There is as much justification to oppose the process by which the UK came together as to oppose the process by which Scotland came together. It was the same process and is common to most of Europe. Scotland united with England because we shared the same island and came to share the same language. This process didn’t happen overnight in 1707, but rather began with the process by which Angles, Saxons, Vikings, Normans and Romans gradually changed the whole of Ancient Britain from being a Celtic speaking land to being an English speaking nation. To regret that process, is to regret the very language with which we speak and the people who we are. If Scotland should be independent because we once were, then this must be applied universally. But this would mean that everywhere in Europe that once was independent should be so again. The point of Kant’s law is that people should ask themselves “What if everyone did this?” If the answer would be undesirable generally, then I ought not to act that way myself. But does anyone seriously think it would be beneficial for Europe to return to a collection of tiny states? Historical progress has come about through unification not through separation. If that were not so, we would remain warring tribes in the Dark ages. The EU is attempting to take that progress further by gradually unifying Europe still more closely. There are great challenges ahead to create a fully democratic EU, but we are not going to get anywhere if we go against the tide of history.